Examiner data was collected from five institutions in two countries who, as a general rule, conduct an oral as part of the PhD examination process – the oral model. From a previous PhD study, we have examiner data from eight Australian institutions – the non-oral model. Over 80 interviews with experienced examiners were conducted in the three countries covering examiners with experience of the oral model only, the non-oral model only, and those with experience of both models. 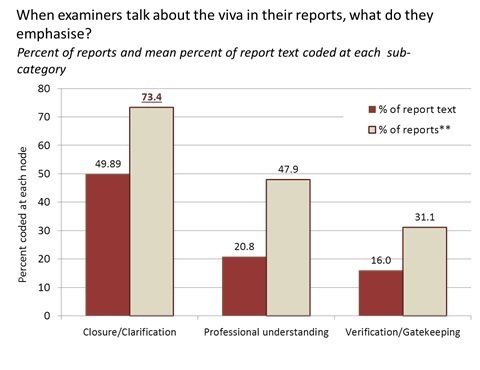 While differences in emphases were found, overall the presence or absence of a viva did not seem to greatly influence what the examiners emphasise in their written reports. Report comments emphasised thesis qualities, with only half of examiner reports mentioning the viva. When mentioned, the expectations of examiners for the viva were primarily directed to the thesis and its improvement. Looking specifically at the text pertaining to the viva, half was concerned with clarification and closure issues. (see figure below). This is in contrast to the literature, the aims of the viva as expressed by each institution, and in examiner interviews. In the latter, while defence of the thesis and assessing knowledge and understanding were foremost, establishing authenticity; providing a finishing point; demonstrating mastery; intellectual exchange; and developing the researcher featured prominently. Further, the interviews specified purposes of the viva (e.g. a ritual and celebratory function) that are not assessment related. Changing examiner recommendation as a result of the viva was the exception rather than the norm. The viva served more to fine tune comments and offer evidence for the original recommendation than to effect change. We conclude that inclusion of a viva would not make a difference to the Australian PhD examination results. What it could do is could offer greater closure for the student and opportunity for collegial exchange.